In prior posts I spoke about my students asking what they should charge a client for design services. See my post: How to Know What to Charge for Graphic Design Work for my advice to them. However, today I wanted to post about the issue of spec work and crowd sourcing for contracting graphic design work. Many times an individual that owns a small business will approach me and say “hey your a design teacher — would one of your students like to get some experience designing this or that project for free”? My answer is a resounding (but polite) NO! Then I explain that students have living expenses too and asking them to work for free is exploitation. Some people really don’t mean to be taking unfair advantage – they might not realize that design is work not just “fun creative stuff”. I came across this article that I wanted to quote from, I think it is important to spread the word to young designers who are so anxious just to get a “real” assignment – that they might fall prey to this. Here is one example of how it works. 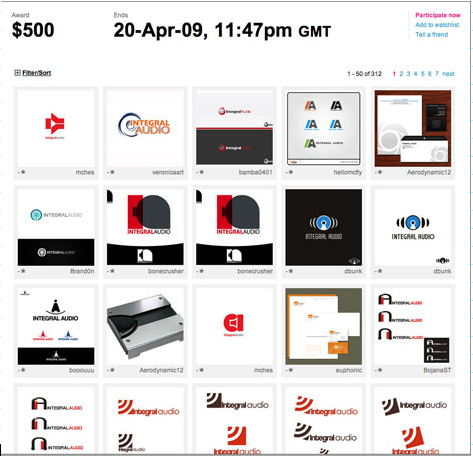 The CrowdSpring Web site shows a grid of designs entered for each project as well as fee, deadline, and a tally of submissions. Winning designs are revealed after the contest ends, indicated by a green triangle. Click below to see larger versions. What is your opinion — I woud love to hear from you?